The venue for Breffni Gun club cold game test. Competing, as anyone who does so knows, is a double-edged sword which inevitably falls on the side of tried and failed more often than tried and succeeded. The successes, when they come, are to be treasured. The failures are remembered for longer simply because they teach us more, making us strive to do better the next time. 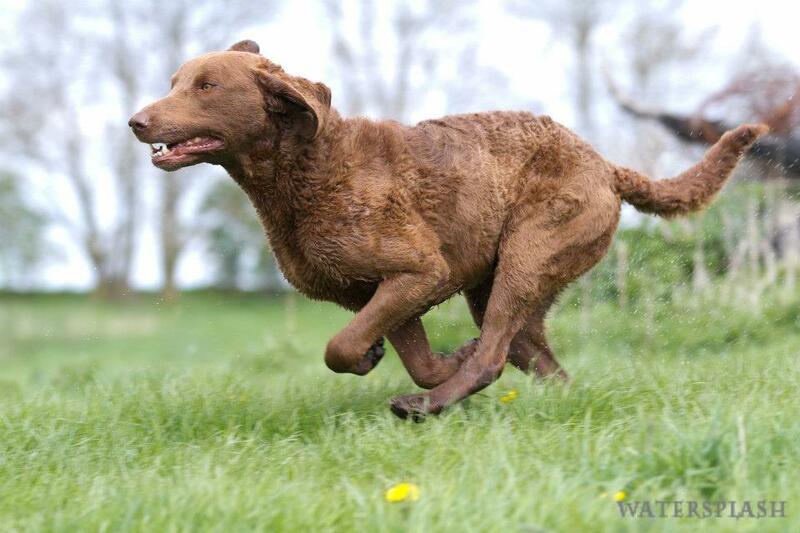 The working test season, for my dogs, kicked off mid April in Cavan. A charity event, organised by Breffni gun club, it is always very well run, with plenty of help and a lovely relaxed atmosphere. 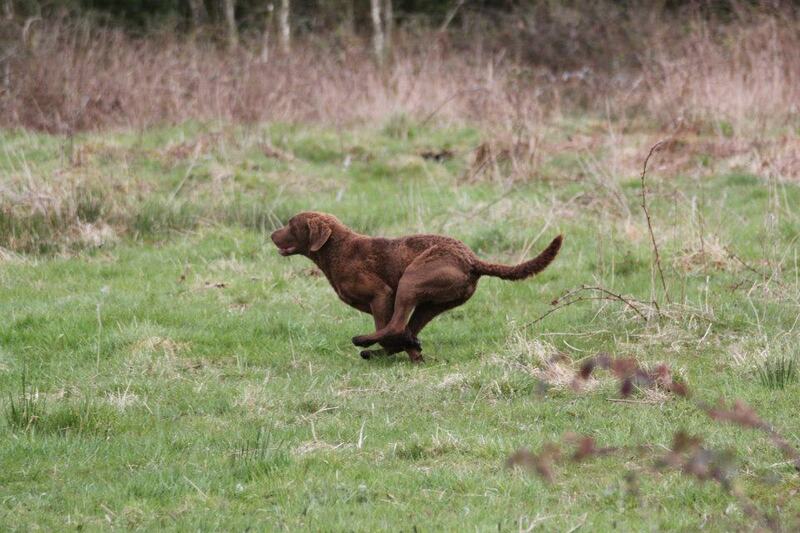 The test was run using cold game which takes the dogs up a gear. During the Winter season my dogs run pretty much off the whistle, indeed my main use for it as we work our way through the cover at Shelton, is as a location device for my dogs to find me. So although we have been training throughout spring they will never be as tight on the whistle through the first couple of working tests in comparison to dogs that have spent a season trialling. …And it showed with Mossy when he ran novice that day. His marking was precise but he was slack to the whistle on blindwork. 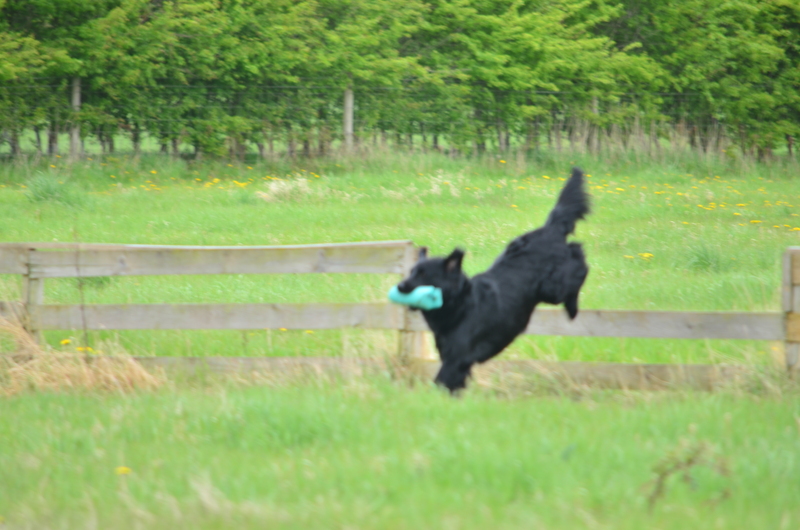 Bertie had a better run in Open. He was only just 3 when he won out of novice. It was probably a season too soon, we underestimate sometimes the level of mental pressure involved for the dog when competing at Open level. They need time to mature and watching him training over the recent weeks I can say that only now he is ready to take on what an Open test has to offer…..well hopefully most of the time. Two out of three tests were 25/25 and 23/25. His marking was tight and clean. The water test was something he hadn’t encountered before. A teal thrown into the middle of six decoys and the dog had to retrieve the teal and leave the decoys. Simple work for a dog that is used to decoying but it’s something I’ve not done with Bertie before. It was one of those tests where a split second decision is going to mean the difference between success or failure. He had marked the fall beautifully and took a direct line into the water, on encountering the first decoy I gave the command ‘leave’ and that was it….wrong command…the dog turned off the decoys and swam to shore. I took him down to the water’s edge and recast, when he reached the decoys this time I gave the command ‘back’ he pushed on , winded the bird and brought it back to hand. Lesson learnt. Bertie on a run out at broadmeadows. Picture courtesy of Tony. 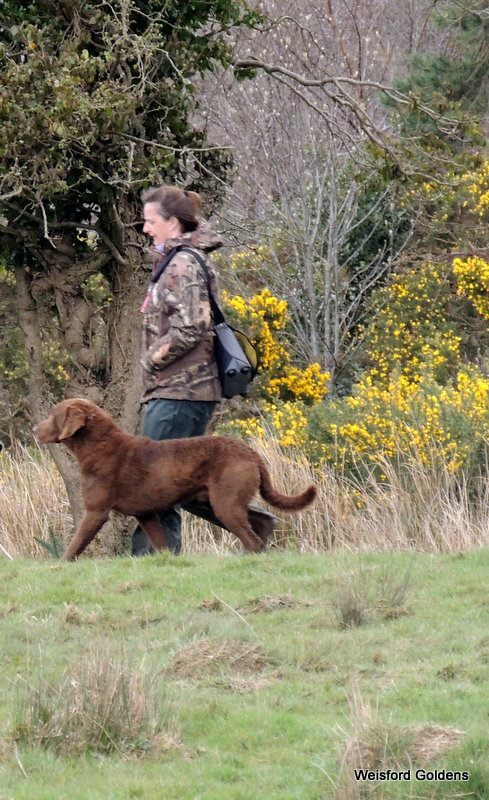 The second working test of the season was in Mullingar, run by the Broadmeadows gundog club it is practically an institution in retriever circles in Ireland. Traditionally it was the test that marked the start of the working test season. It is also a qualifier to pick the Irish team for the two International retriever events held at Shanes Castle and Birr Castle during the Summer. I took Bertie on his own for this test primarily because I wanted a chance to see how he would be in a line up prior to the Minority breeds test in the UK the following week. I truly had no expectations as the field was large with 26 dogs running and many of the top field trial dogs in the country in attendance. Listening to the judges direction before a retrieve. The diversion at the water test after drifting. The water test was set on a lake. The wind was blowing hard now in from the north east to the dog’s right. A single diversion was thrown out into the middle of the lake to the dog’s left. The dog was then being sent for a blind across on the far bank of the lake. The temptation was, of course, that the dog would pull for that diversion in open water and all would be over. We were near the end of the field by the time it came to our turn and I had watched many dogs fail. I set my dog up and faced him directly towards the diversion. He marked it well. I turned him and cast him well away from the direction of the seen retrieve. He entered the water, started to pull left, I peeped and cast him right back…he got the message and swam on. 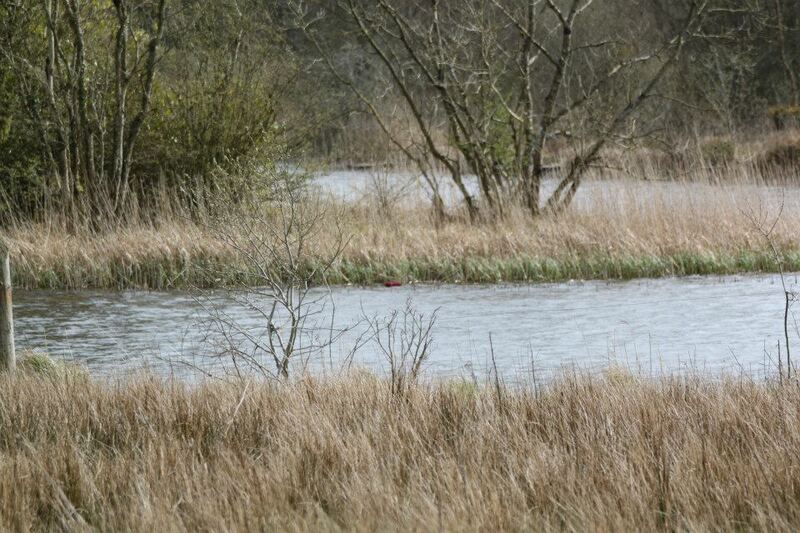 The next challenge was to get him onto the blind which was laid at the water’s edge among reeds. If he banked it would be a harder job as the scent would be below him. As he approached the far shore I peeped again, he turned right, winded the dummy and locked on. 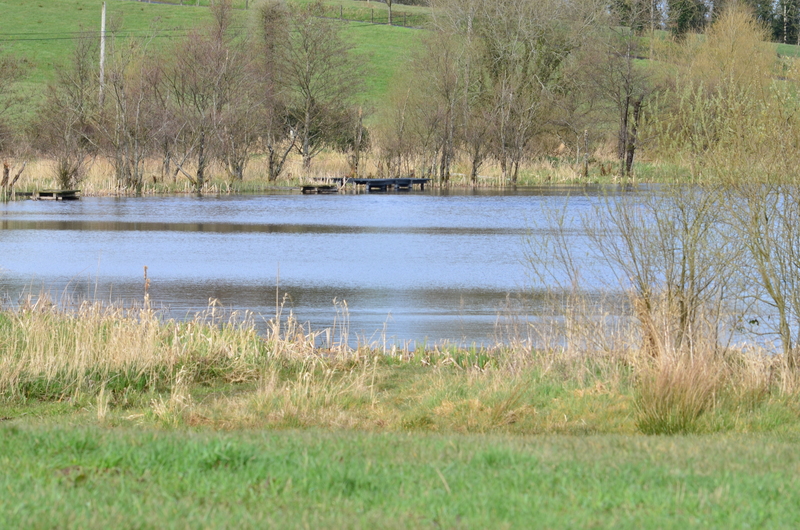 First half complete….I called him back and at the same time looked around to see where the diversion had drifted to as the wind was carrying it down the lake at pace…thankfully it was still in open water. I handed the dummy to the judge and set up my dog. I let him hit the water at the point where he expected that diversion to be and swim out, peeping and casting left when he hit the point of first fall. He saw the dummy and again locked on. 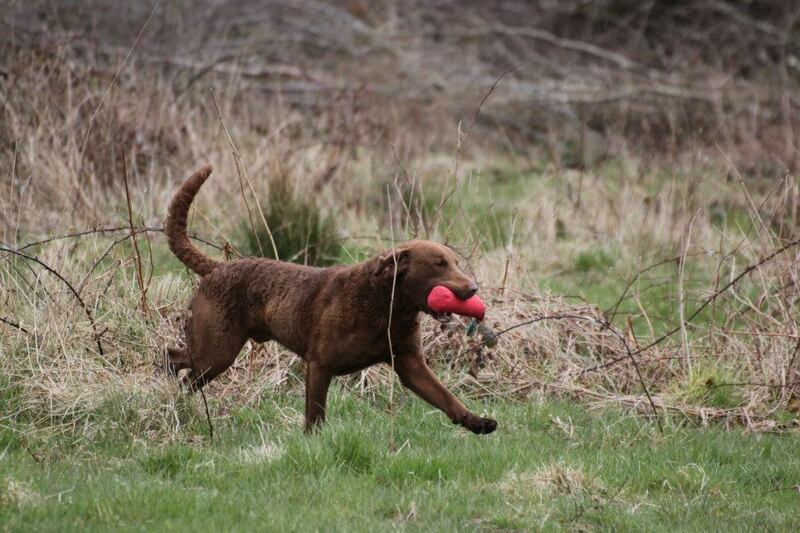 That will most likely be my retrieve of the season for him….the buzz of completing such a technical retrieve is hard to describe. His final score that day was 92/100. He finished overall 7th , just one place outside qualifying for the team event. A flatcoat clears the jump in the Minor breeds team test. A week later we were on the ferry and heading east to Evesham in Gloustershire. 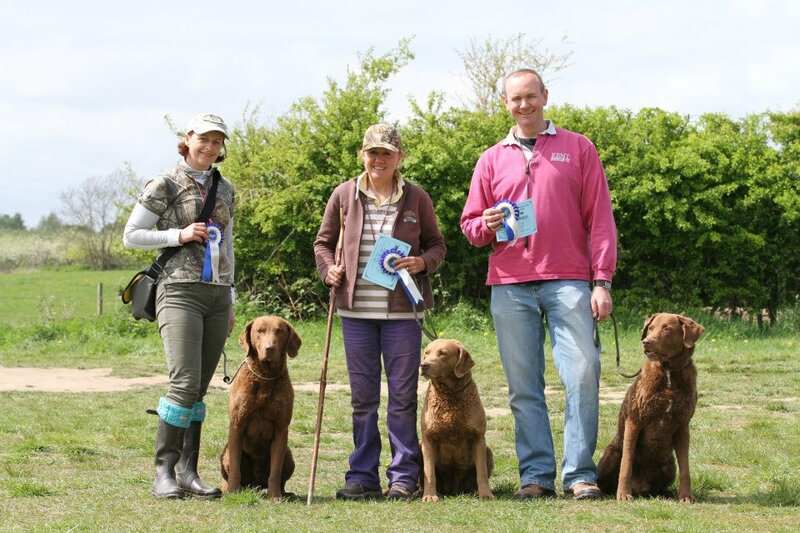 Bertie was competing as part of a team in the Minority breeds working test. 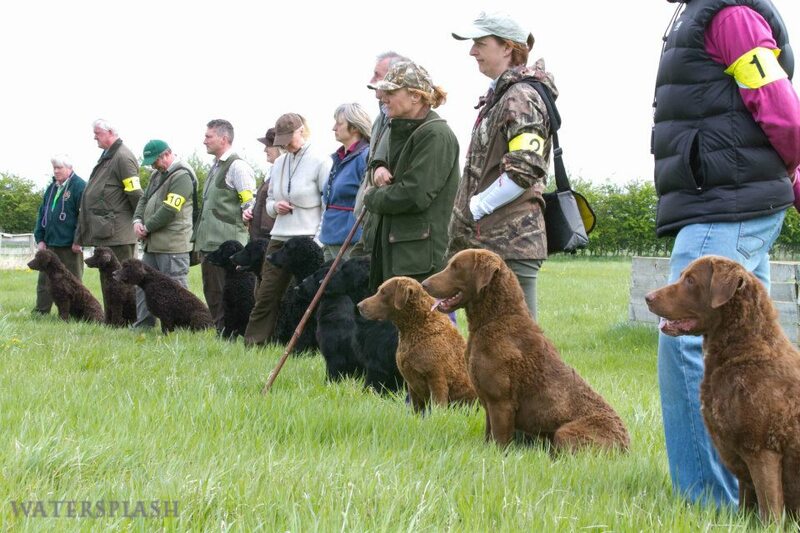 Four teams of 3 dogs all different breeds of retriever – There was a team of Curly coated retrievers, Flatcoated retrievers, Irish Water Spaniels and of course the Chesapeakes. I was excited and nervous.This was to be our first time competing as part of a team. It’s one thing competing as a single dog/handler with no responsiblity but to yourself but to be part of a team carried extra responsibilty. Sitting out a simulated drive. Photo courtesy of Ms Sue Worrall. Echo aged almost 10 our most experienced team member. It appeared that in her group instruction the judge required that the handler was to wait for her instruction before sending for the second retrieve, this was something unusual and I hadn’t encountered before. There was the possibility that although Bertie had been foot perfect he could potentially zero on that one, small, technicality and that was my fault. Bertie at the water. Photo courtesy of Ms Sue Worrall. 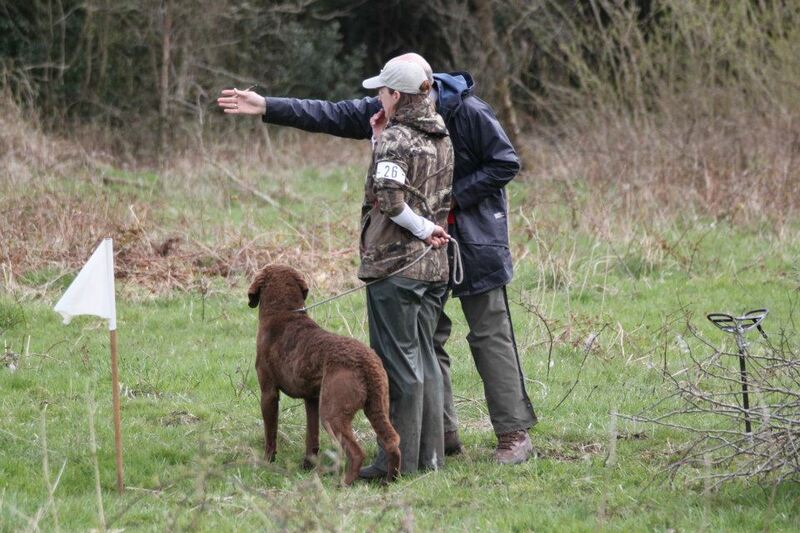 ….and he did, she zeroed his retrieve. I was gutted, i had let the team down and I had let my dog down. Our team finished second, 19 points behind the winners…it is an error I will never forget again. I will most likely always insist on an individual explanation if the judge gives a group description. Did the judge mark harshly? who knows? it is her perogative and I’ve got to accept it, learn from it and move on. Our team…we fought the brave fight. Photo courtesy of Ms Sue Worrall. 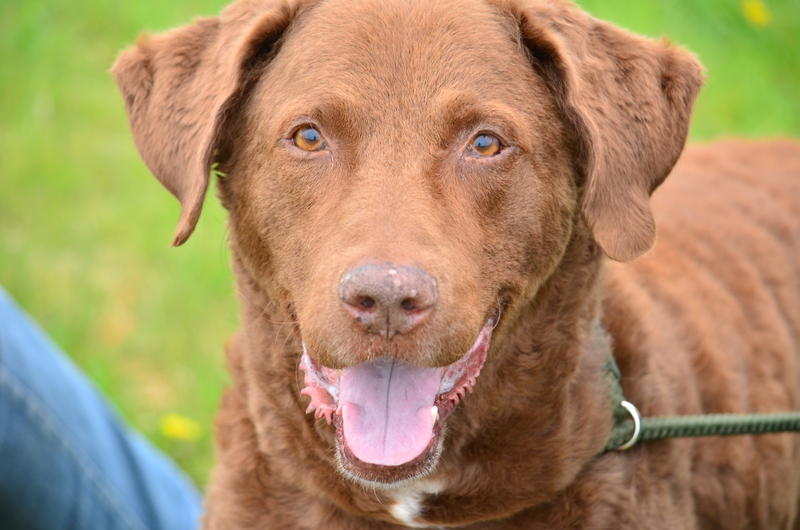 This entry was tagged animals, dogs, editor, gundogs, nature, retrievers, short post, writing. Bookmark the permalink. ← ‘Look for the smallest try and build on that…’ Jason Mayhew. Hunting chef William Alldis shows you how to live off the land and create mouthwatering recipes for peanuts! Grow it, forage it, kill it, cook it and enjoy it. When you got nothing, you got nothing to lose. — Dylan. City girl turned country woman writes about life on a ridge with her Golden Retrievers the "Sun Dogs" her horses, goats, and a wild burro named Rosie.